Friday at Bonnaroo brings not only the first full day of music, but also the opening of the festival’s two main stages, What and Which, allowing for more marquee acts and also the weekend’s first headliner. True to its near 24-hour nature, Bonnaroo performances ran from 1:00 p.m. to 5:00 a.m. If you took a look at the name of Bonnaroo’s Friday headliner and went “Who?” you are probably over the age of 40. A fellow middle-ager myself, I had a small leg up on some of my age peers in having seen a few minutes of LCD Soundsystem when they played Bonnaroo in 2010. Even then, I’m not sure I quite get the link between the band who played a tent stage in 2010 and the recently reunited headliner of today. But, as LCD Soundsystem are pulling the rare feat of headlining all three of America’s tentpole festivals (the other two being Coachella and Lollapalooza), their worthiness as a major festival headliner isn’t debatable. LCD Soundsystem’s performance also further emphasized that, if funk was Thursday’s musical theme, electronic music was Friday’s. While not normally my cup of tea, LCD Soundsystem did what they needed to do as a headliner. They were engaging, they played with energy, and the fans in attendance lapped up hits like “All My Friends”, “Daft Punk”, and “Dance Yrself Clean”, which was accompanied by a fireworks display. Vocalist James Murphy is undoubtedly a talented lyricist and his use of live percussion is interesting. Where most bands have to mitigate the natural dissonance that exists when digital meets analog, Murphy and company live there, with the persistent drums sounding like the heartbeat of some cyborg from a sci-fi novel, clinging to its last vestiges of humanity. I had never seen Fort Worth’s native son Leon Bridges before today and after seeing him perform, I regret missing out. With stiff competition, Bridges distanced himself from the pack by pure stage presence alone. Playing in The Other Tent, the smallest of Bonnaroo’s three main tent stages, Bridges proved that his next trip to Bonnaroo will likely include an upgrade as the overflow crowd certainly warranted. For his 75 minute set, Bridges seamlessly transitioned between ‘50s style doo-wop, early soul, and some good old Chuck Berry style rock and roll. The clean cut and boyish Bridges even looked like he’d been plucked from 1955 and plopped onto a farm in Manchester. Like a lot of kids who grew up in the ‘80s, there’s something about a synthpop band that grabs me. I was more of a metalhead in my youth, but you couldn’t come of age in that time without being exposed to heavy doses of Human League, Thomas Dolby, and Howard Jones. So the badly in need of buying a vowel Scottish trio consisting of Lauren Mayberry, Iain Cook, and Martin Doherty touch something in the formative DNA of my musical life. Melding heavy doses of ‘80s synth with modern electronicam Chvrches separates themselves from the pack with their lyrics. The diminutive Mayberry brings a huge presence to the stage and the band’s overarching themes of empowerment are delivered in an easily digestible package of keys and precise pop vocals. There was plenty to love for roots music fans on Friday at Bonnaroo and it all started with Aussie sensation Henry Wagons. Playing Bonnaroo’s tiny Who Stage at 1:00 p.m., practically dawn in Bonnaroo time, Wagons nevertheless drew a respectable crowd. An entertainer first and foremost, Wagons peppered his show with plenty of jokes and crowd callbacks, as well as an obsession with the free donuts on offer at the café next door. Near the end of the set, Wagons even stepped out into the audience, trying on a fan’s crown and generally playing up the impish side of his nature that made him famous. You can catch my post-performance chat with Wagons here. 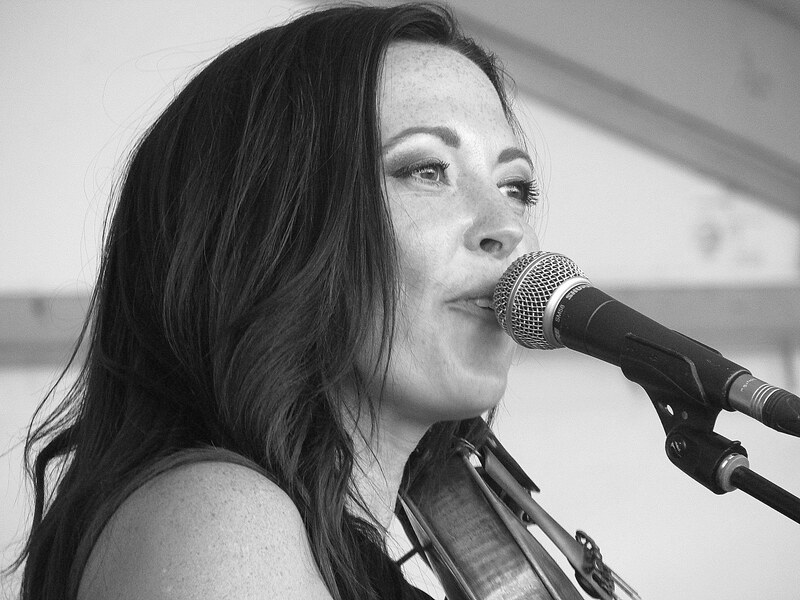 Another club stage performer who impressed was Amanda Shires. Shires also gave me my first agonizing conflict of the weekend, as she played at the same time as jazz saxophonist Kamasi Washington. I chose Shires because, while I’ve seen and been impressed by her before numerous times, it’s always either been with Jason Isbell or sitting in on an Americanafest set. The one other time I saw her billed under her own name, Isbell was playing guitar in her band and the artist she opened for, Todd Snider, also popped in. So it was refreshing to see how well Shires could hold an audience on her own merit. The answer is well. Playing a mix of songs from her previous albums and just enough from her forthcoming new album to whet the appetite, Shires proved she doesn’t have to live in anyone’s shadow. Showing two more facets of the electronic music scene were M83 and Tame Impala, who bookended LCD Soundsystem on the festival’s second stage, named Which. French group M83 has many of the same ‘80s synth trappings as Chvrches, but puts a lot less of the focus on the lyrics and more on creating a lush dream pop atmosphere in which the soaring voices are primarily another instrument in the wall of sound. Tame Impala, playing the coveted Bonnaroo Late Night set, throws back not to the ‘80s but to the psychedelic rock of the ‘60s, using modern electronics and heavy pedal effects to put a modern twist on an old concept. Rounding out the day was Cuban/French twins Ibeyi. Bonnaroo has always had a strong element of world music and Ibeyi was another chapter in that story. Singing in both in English and Yoruba, a Nigerian language used by their ancestors before they were brought to Cuba as slaves by the Spanish, the duo melds their African heritage with the Latin elements of their native country. For 10 of Bonnaroo’s 15 years, the weekend’s biggest party has not only not happened in Centeroo, but also is a completely unsanctioned gathering. Bonnaroo super-fan board Inforoo hosts a brunch in the Tent Only camping area that draws over a hundred fans, each bringing food from their region to contribute. But the Inforoo Brunch isn’t just a gathering of fans and food. The group also raises money for charity each year and even hosts a “sponsorship” drive for board members down on their luck who can’t afford a ticket. Saturday brings performances from the likes of Anderson East, Chris Stapleton, and of course, the headliner Pearl Jam. I’ll be back tomorrow with another day’s adventures.